Why is My Water Coming Out Dirty? There's something just so refreshing about water; we drink it to stay healthy, we bathe in it to stay clean, and we even flock to the water of pools and beaches to relax. We all rely on water, so we definitely understand your concern when you turn on the faucet and are met with anything other than the perfectly clear liquid you were expecting. Pink: If your water is coming out pink it's likely due to the presence of potassium permanganate. This chemical is safe to ingest and is used to treat your water. Redish-Brown: Rusty looking water is just that—rusty water. Rusty water is worse for your plumbing fixures and clothing as it leaves behind stains that need to be treated with rust remover than it is for you to injest. You should be able to clear things up quickly by simultaneously running all of your faucets with cold water at the highest pressure. Yellowish-Brown: Never drink yellowish brown water. This color usually means your water is harboring organic material, which could be a little extra bacteria, or it could be sewage. Call a plumber to have the cause identified and repaired immediately. Blueish-Green: Blue/green water is an indication that you have copper pipes that need to be replaced. Again, call a plumber immediately as you should not ingest too much copper. If you're only having a problem with the water coming out of one faucet, the problem is with that singular pipe and will return to normal once the problem pipe is replaced. Black: If your water is coming out black, you're going to need to inspect more than the color. If your water is both black and has a distinct smell, you likely have sewage leaking into your water and will need to call a plumber immediately. 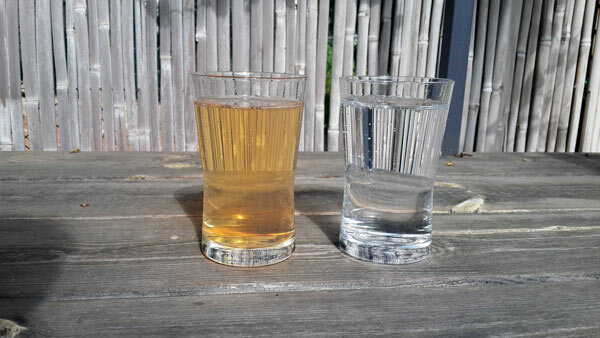 If your water is coming out black and odorless, then you just have a little extra manganese in your water, which you should have tested by your local health department to see if it's safe to consume. White: If your water comes out looking milky, you don't actually have a problem. The "color" you're seeing is just air bubbles which will rise and pop after about a minute leaving you with perfectly safe, clear water. This "problem" tends to arise when your water temperature is drastically different from your room temperature, which often happens with significant changes in weather. If you suspect your dirty water is dangerous to consume, give us a call at (864) 242-5511 or click the banner below to schedule service online and we will help you identify and repair your problem. Your family's health and safety is our top priority, so we're here 24/7 for any emergency plumbing situations that may arise. If you enjoyed this plumbing article, please check out other posts on our blog and join us on Facebook, Twitter,LinkedIn, and Google+ to see why the Greenville, SC area calls us "The Picky People's Plumber!"